Some options in stock. Order in the next 9 hours, 55 minutes and it will go out today! This is a whole new system and shape evolved from Handysounds, which has been a big hit around the world. How do you play music without musical instruments? Nowadays it's not so hard to find apps for it; however, you will have an ability to play music with everyday objects without apps if you were a magician. There are some effects we can show you, but they are just a small part of unlimited possibilities. PIANO: You ask someone to draw a keyboard on a blank sheet of paper with a normal pen. When you press any key, a sound of piano is played. You press some keys, and then a classic melody is played using the paper! Your hands are empty and everything can be examined. You can give this keyboard on the paper to your spectator as a souvenir after the performance. VIOLIN: Have you ever wished to play a violin elegantly? You hold a chopstick under your chin as if it were a violin, and hold other chopstick as a bow.Now you can start your violin recital. ELECTRIC GUITAR: You go to someone's birthday party. You hold a fork and a spoon in your hands and say, "please give me a few minutes to practice..." then you start to play sounds without an electric guitar but a fork and a spoon. Finally you play birthday song, and everybody can sing with you.Your hands are empty and everything can be examined. Each unit contains various sounds, and melodies from classic songs or to the birthday song. You can play musical instruments at Anytime, Anywhere. 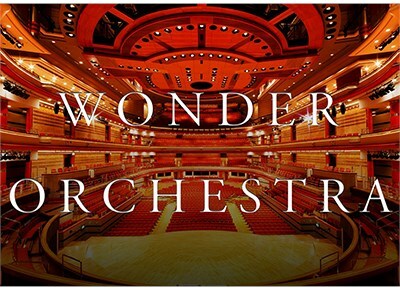 WONDER ORCHESTRA is great for close-up, street, parlor and also birthday party as well.